Are you tired of loose wooden joints that wobble, squeak or loosen over time? Looking for a chair repair solution that actually works? Tite Chairs® quickly fixes those wooden joint problems. Just apply a few drops of Tite Chairs® into the loose joint. 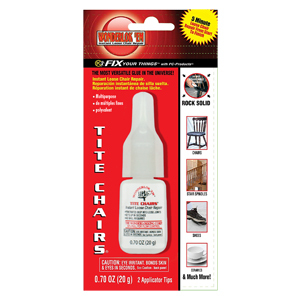 Tite Chairs® does not swell the wood, but is actually a super powerful adhesive with almost 4000 psi of holding power. Not only is it super strong, Tite Chairs® is also super thin. This means that it can penetrate loose joints in chairs and other furniture without having to take them apart! That means less time for the repair and less mess to clean up. 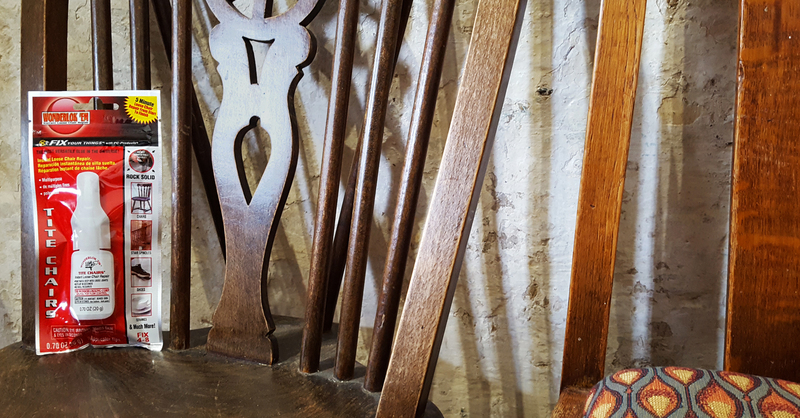 Furniture, loose tool handles, staircase spindles and dovetail joints, as well as metal, rubber, glass and most ceramics. Yes, there are 2 applicator tips included. Useful tips to make your Tite Chairs® experience more efficient.